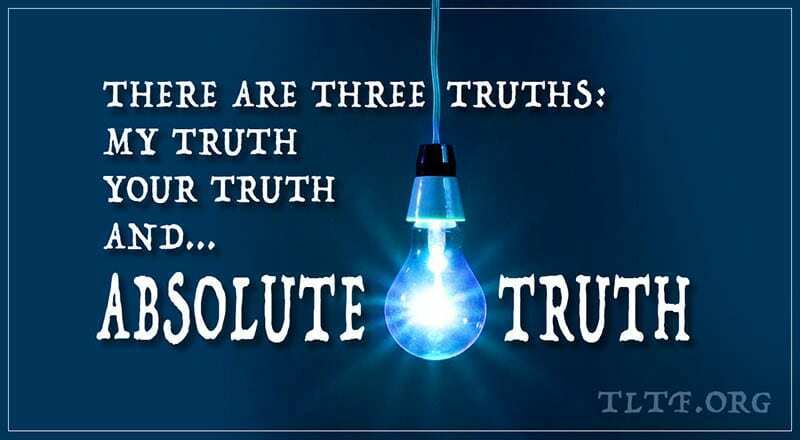 Is There Such a Thing as “Absolute Truth”? Think about the Postmodern answer to this question: “NO, there is no such thing as absolute truth.” Huh? Isn’t that declaration both an absolute statement and a self-contradiction? Of course it is. Jesus Christ made a couple of declarations that answer the above question and show us the two sides to the gold coin of Truth. In John 17:17, he said to God, “Your Word is truth.” In John 14:6 he said, “I am the truth.” Thus Jesus showed us both the doctrinal, propositional aspect of Truth and its practical, behavioral aspect. But that is exactly what people do when it comes to God or spirituality. They make up things and then think those things are right just because they believe them. Or they believe fables made up by other, more famous (and long dead) people in the past. The written Word of God is absolute Truth. As we look closely at His Creation, we see absolute Truth woven into its fabric. For example, the law of gravity is fairly constant, wouldn’t you say? Ditto for the myriad of other such laws upon which the technological progress of mankind during the past 600 years has been based. Jesus showed us that we are not only to learn the Truth but also to live it. Because he precisely learned the Word of God and perfectly practiced it, he was the personification of Truth. If there is no absolute Truth, life is little more than a chaotic mass of 7 billion little “gods” each proclaiming their own truth, often at the expense of one another.